Portsmouth, New Hampshire’s icon is vintage and elegant and something you will see other versions of throughout New England. You’ll find it perched on top of the North Church of Portsmouth. The roots of the church date back to 1671 and the present structure was built in 1855. 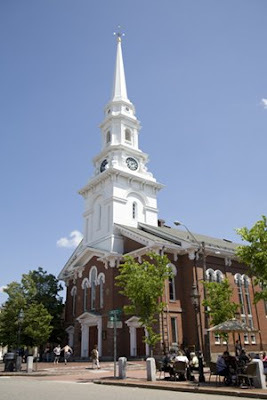 Dotting the landscapes of New England you will see white church steeples throughout the region. The spires are simple in form and most often made of wood. They are in a sense the obelisks or minarets of Christianity. In recent years some churches are allowing cellular antennae to be hidden inside steeples to bring in income. Not a bad idea considering how expensive they are to restore. 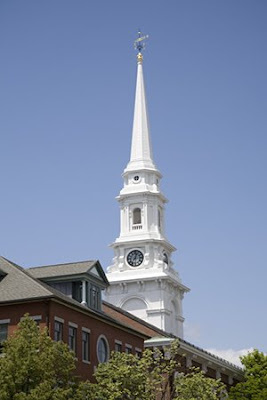 A recent renovation of the North Church Steeple cost $1 million. These are really elegant steeples. I have a postcard of the North Church on my desk . . .from when I visited NH last summer. Portsmouth is a great town. Fascinating fact about the cellular antennae. beautiful church...hope you are having a relaxing time up there.. I'll second what Fly Girl said. Elegant was exactly the word that sprung to my mind. Rajesh and Fly Girl, I couldn't help but notice how steeples like this there were. Bee, don't you love Portsmouth? Catherine, it was very relaxing. Gil, Thanks for stopping by. I'm back in NYC. If you find yourself coming this way give me a shout would love to meet up.